We all need a little balancing in our lives. My pure blend of essential oils blended for each individual chakra can help you do that. Every order of Chakra Spray comes with a Chakra Chart showing where the chakras are located, crystals used, affirmations and the meaning of each chakra. 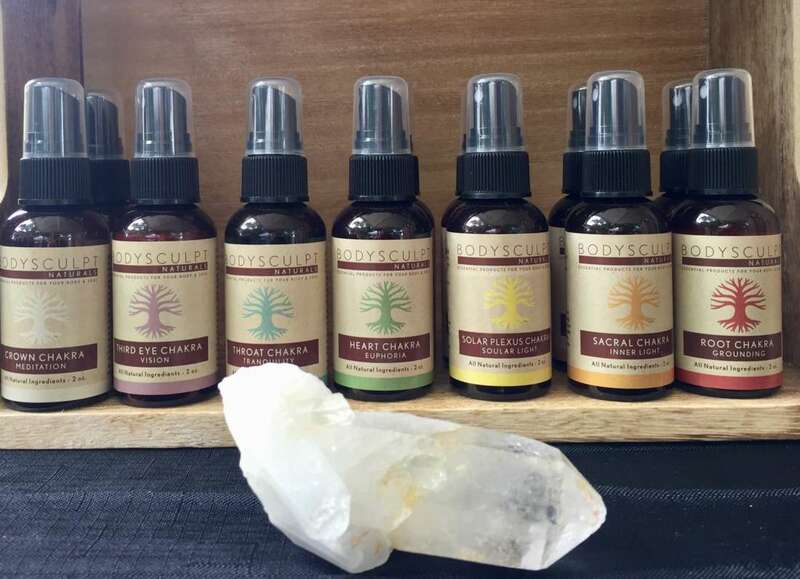 Each Chakra Spray has a small crystal inside the bottle representing the individual chakra. Ingredients: Essential Oil Blend: Sandalwood, Lavender, Rosewood Frankincense. Distilled Water, Grapefruit Seed Extract. Clear Quartz Crystal. How to Use: Spray on & around, yourself, on your Crown Chakra (top of head) or around a room to diffuse your connection to your divine higher self. Shake well before use. Ingredients: Essential Oil Blend: Rosemary, Clary Sage, Spruce, White Sage. Distilled Water, Grapefruit Seed Extract. Amethyst Crystal. How to Use: Spray on & around, yourself, on your Third Eye Chakra (forehead) or around a room to enhance your ability to visualize & see things clearly. Shake well before use. Ingredients: Essential Oil Blend: Lavender, Sandalwood, Rosewood, Blue Chamomile, Geranium. Distilled Water, Grapefruit Seed Extract. Kyanite Stone. How to Use: Spray on & around, yourself, on your Throat Chakra (throat) or around a room for clear communication, truthfulness & to cast out judgements on self or others. Shake well before use. Ingredients: Essential Oil Blend: Rose, Neroli, Bergamot. Distilled Water, Grapefruit Seed Extract. Rose Quartz Crystal. How to Use: Spray on & around, yourself, on your Heart Chakra (chest) or around a room for love of oneself & others, acceptance & compassion. Shake well before use. Ingredients: Essential Oil Blend: Lemongrass, Bergamot, Petti Grain, White Sage, Juniper, Benzoin. Distilled Water, Grapefruit Seed Extract. Citrine Crystal. How to Use: Spray on & around, yourself, on your Solar Plexus Chakra (solar plexus) or around a room for centering, personal power, emotional will & to balance digestive system. Shake well before use. Ingredients: Essential Oil Blend: Orange, Ylang Ylang, Rosewood, Cedarwood. Distilled Water, Grapefruit Seed Extract. Carnelian Stone. How to Use: Spray on & around, yourself, on your Sacral Chakra (just below belly button) or around a room for creativity, feeling safe & reproductive organ issues. Shake well before use. Ingredients: Essential Oil Blend: Sandalwood, Black Pepper, Rosewood. Distilled Water, Grapefruit Seed Extract. Garnet Stone. How to Use: Spray on & around, yourself, on your Root Chakra (base of spine/pelvic area) or around a room for money issues, feeling safe & secure, grounding oneself, enhance physical vitality. Shake well before use. Take a break from putting chemical compounds on your skin every day and use naturally occurring ingredients to bring out the natural beauty that exists in all of us. So why not bring out your natural beauty?